In this article, we are going to learn how we can change the behavior of a class methods or fields during runtime that is how you can access a private member of a class by changing its behavior from private to accessible. 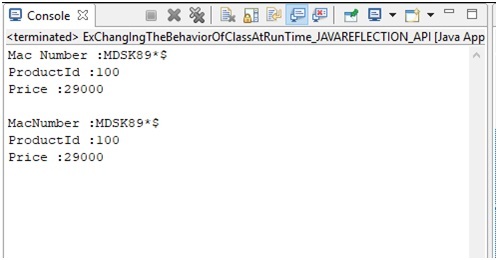 JavaReflection API provides methods to change the behavior of a class. Let’s understand this by an example. Here, if we can access price data member of the class as it is public but we cannot access name data member as it is private. In order to do this we have to use a javaReflectionAPI method setAccessible(true). This method change the behavior of a data member, takes a boolean parameter that is true or false if it is set to true then that data member will become accessible. Here, we are able to access the fields that were private in the above class.